The Venefit Procedure was formerly known as VNUS Closure. 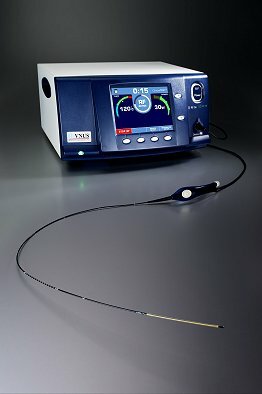 The Venefit procedure is similar to endovenous laser therapy (EVLT/EVLA) but instead of using a laser fibre, direct and milder heating of the vein wall using the ClosureFast™ catheter seals the abnormal channel. Like endovenous laser therapy, Venefit can be performed on an outpatient basis using local anaesthesia in which the doctor numbs the leg before treatment. The ClosureFast™ catheter is inserted into the vein through a tiny incision below the knee. Guided by ultrasound imaging, the surgeon treats a 7 cm segment of vein with a 20-second burst of radiofrequency energy, causing the vessel to shrink around the catheter. 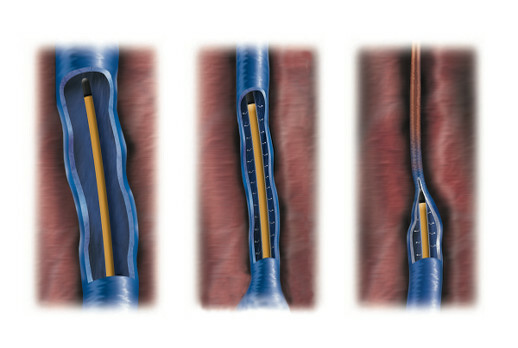 The surgeon withdraws the catheter, treating each segment until the entire length of the vein has been sealed (Figure 1). An average 45 cm length vein can be treated in this manner in just three to five minutes. Unlike painful vein stripping surgery or laser ablation, the catheter delivers uniform, consistent heat to each segment and temperatures do not exceed 120°C. As a result, the Venefit procedure causes less bruising and allows for rapid patient relief and recovery. The Venefit procedure is commonly performed in an office or an outpatient setting and is covered by most health insurance in the United Kingdom. The Venefit procedure eliminates the need for groin surgery and general anaesthesia. The procedure also results in little to no scarring similar to endovenous laser therapy. • Up to four times faster improvement in patients’ quality of life with ClosureFast™ catheter versus laser based on a quality of life questionnaire. Other studies have shown that patients receiving the Venefit procedure return to normal activity and work significantly faster than those undergoing vein stripping.